two years of purchase and we'll make it right." Having checked out the Tee on the SmartWool website, I pretty much knew what to expect in the way of the Tee's looks and features. Upon the Tee's arrival, my expectations were met and pleasantly exceeded. After all, I couldn't possible anticipate how soft and light the Tee would be from the picture! And soft and light would be how I would first and foremost describe the NTS Micro 150 Tee! The Micro 150 designation of this Tee makes it SmartWool lightest base layer. I can liken the texture of the Tee's 100% Merino wool material as almost tissue paper-like. When I hold up a single layer of the Tee to the light, I can almost see through it. Rather "heather-y". The Tee is constructed with a modified raglan sleeve style so there aren't any seams on the shoulders of the top but rather there is a seam diagonally from the moderately scooped neckline to the sleeves. The back of the Tee has a yoked seam just about at the shoulder blades. Side seams, wrap slightly around to the front to create a more feminine shape. SmartWool thoughtfully uses a flat stamped logo and size tag at the neckline in the back and a soft care instructions/content tag on the left seam near the waist line. The seams are all flat seams and so there is nothing to rub or irritate my delicate :) skin. A small stamped SmartWool logo man is positioned at the left side near the hemline. An interesting note about the care tag - attached to this tag is another tiny tag that gives a serial number and the date manufactured. While I've often seen manufacturing years, I've never had the date specific to the month! The sleeve length is just about 21 inches (53 cm) from the underarm joint seam to the cuff of the sleeve. From the top of the neckline to the hem, the Tee measures 25 inches (64 cm). Care instructions are printed on a small fabric tag sewn into the left side seam near the hem. The care instructions are written in several languages as well as depicted in the international care symbols - of which I can never remember the meanings! SmartWool also briefly describes care instructions for their Merino wool products on their website as well. Briefly put, to keep my Tee in the best shape, I am told to: machine wash the top in warm water on a gentle cycle. I should not use bleach and fabric softener is not recommended. According to SmartWool, to dry, the tee should be put in a dryer and tumbled dry on the low setting. I usually hang dry my wool items, so this will be interesting for me to try using my electric dryer. A low iron setting is recommended (but fat chance, I iron it - ever!). Alternately, the tee can be dry cleaned. As I expected based on past experiences and the SmartWool size chart on their website, the Tee fits me just the way I like it. It's not too tight as to show ever little ripple or bump from bra straps, but it is certainly form-fitting enough to lay flat under another layer. And since "NTS" means "next to skin", a good fit is very important. The Tee is lightweight with minimal bulk. I like how the neckline is spacious enough to fit over my head without a struggle, yet the scoop neck doesn't expose too much skin to the cold. The sleeve length is perfect, right to my wrist without needing to be folded up to prevent restricted hand movement. And the hem length is great - long enough to be tucked in to even low-rider pants if need be. My initial try-on of this Tee confirmed just how soft a wool tee can be. The texture of the material is down-right silky I love the feel and life is good! The Tee arrived just as I was getting ready to take my daily 4-mile (6.4 km) walk to the mailbox. Since it was a beautiful cool (mid-50s F/30 C) day, I quickly pulled off the base layer I was wearing and put on the SmartWool Tee. I was happy! Now I can't wait for more outdoor adventures where the SmartWool NTS Micro 150 Tee and I will brave the winter winds and snow. Can't see my NTS Micro Tee? First off, was our annual Christmas/Anniversary (#46!) snowshoe overnight at Rocky Mountain National Park near Estes Park, Colorado. It was unseasonably warm and uncharacteristically not windy. Even at elevations about 11,000 ft (3350 m), we reveled in sunshine (when we weren't on the "wrong" side of the mountain) and 45-50 F ( 7-10C). At the end of January, I spent seven days in coastal Florida where they were having a "cold snap" and the temperatures were never higher than 70 F (21 C). There, too, the heavens seemed to weep constantly. Alas, though I had big plans, due to a death in my family, my hopes of some backcountry Floridian adventure were dashed and off I was to New Jersey. I spent the next two weeks in New Jersey, pining for the outdoors and some sunshine while central Jersey experienced three storms, each dumping two-digit inches/centimeters' worth of the white stuff. Though I only had a couple of pairs of sandals from my aborted Floridian trip, I borrowed my sister's tennis shoes and I slogged through the slush on daily walks in my sister's neighborhood - it was the best I could do. There the temperatures were frigid; 10 to 30 F (-12 to -1C). Fortunately, between all the horrible weather elsewhere, most of my winter time in Colorado was bee-u-ti-ful! We had lots of sunshine, little precipitation and for the most part, the temperatures were above normal. Daily "highs" averaged between 50 and 75 F (10 - 24 C). 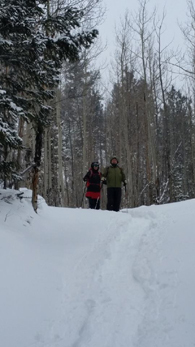 In addition to my daily hikes in south central Colorado - Canon City, where I call home - I wore the Tee on several snowshoes in the Wet Mountains. Since I received the SmartWool NTS Micro Tee in early December, I have worn it at least twice a week every week. Most weeks, those wearings were casual wear at home and in the office along with daily four-mile (6 km) hikes down my hilly dirt road to the mailbox. My daily walks are my conditioning hikes which include a backpack weighted down to my usual 25 lb (11 kg) three-four day trekking weight and are therapeutic (mental breaks from accounting work) as well as "training" for longer backpacks. Obviously, I don't wear a backpack around the house or in my home office. Most of the time, when indoors, I wore the Tee with a light vest or under a flannel shirt. During outdoor activities (hiking/snowshoeing), I wore the Tee with a light to medium down vest and a lightweight outer layer, either a hard shell with a fleece lining or a down jacket depending on the temperature. I found the Tee to be extremely comfortable when layering. It fits close to my body and is so smooth as to not add any bulk and to allow mid-layers to easy glide over it. I hardly can tell I have the Tee on except for the extra warmth it provides. There is no constriction around my elbows where I often find multiple layers tend to bunch up. And that warmth is ridiculously copious for the amount/weight of the material! It's down-right mysteriously wonderful! Since the Tee is the clothing that is closest to my skin and actually hugs my body, I am happy to report it is not itchy or scratchy. It feels more like silk than those old wool thermals I had as a kid. No need to discreetly shift my backpack around to relieve an unreachable bit of chafed skin. This fabric feels soft and soothing. I'm also very appreciative of the anti-odor qualities of the NTS Micro Tee. No matter how heated and sweaty I got or how many days in a row (record was four straight days and nights) I wore the Tee; at no time did I smell offensively. (I didn't, did I, guys?) Well, I do know that when I removed the Tee, I didn't pass out when my head was buried in it! And while, the comfort and utility of the Tee is paramount for my approval, also right up there is how well did the Tee survive the wearings and washings. Very well, I say! I washed the Tee at least 8 times, always in cold water, gentle cycle with normal powdered laundry detergent. I never used bleach or fabric softener and alternately line dried or machine dried it to a slightly less than completely dry state. No, I never ironed it, even though the care instructions indicate I could. The Tee still looks good! Wearing the Micro NTS Tee these last four months has been wonderful! I have a lot of base layers and am particularly fond of my wool layers. After experiencing the comfort and utility of this SmartWool Tee, I can unequivocally say I have a new favorite! I am looking forward to wearing it through the coming spring months when the weather in "my" mountains remains cool and unpredictable. Since my last report, I have continued to wear the NTS Micro 150 Tee at least once a week, both casually and while hiking/snowshoeing/backpacking. Most of the time, the weather was on the cool side (freezing to 50 F/10 C). I wore the Tee under a light down vest while indoors and added a light down jacket or a wind shell for the outdoors. The locations were mostly all in the south central mountains near my home in Canon City, Colorado and in the Arkansas River Valley nearby. The terrain includes the Wet Mountains and Cooper Mountain ranges with altitudes of 5000 ft to 12,000 ft (1500 m to 3600 m). 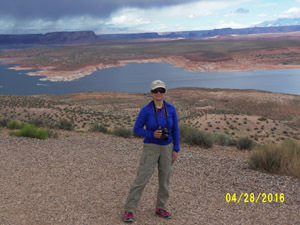 I also just returned from a 10-day trip to Glen Canyon National Recreation Area in Arizona near the Utah border where it rained every single night and morning. Temperatures during the day never rose above 65 F (18 C), averaged 58 F (14 C) and dipped down to a low of 42 F (6 C) at night. There are a several things I ask of my base layers. First, they must feel good against my skin. Second, they must do the dual, contradictory-sounding jobs of keeping me warm and keeping me cool. Third, the base layers need to be able to be comfortably worn underneath other layers. Fourth, they need to be sturdy and able to stand up to careless treatment over several days. And lastly, they need to not stink after those several days of wear! In this field evaluation of the SmartWool NTS Micro 150 Tee, after several months, I've found the NTS Micro 150 Tee to meet all of my requirements nicely! This Tee is super soft and feels more like silk against my skin than wool. I am always amazed at the texture and am now a die-hard fan of wool base layers, no matter the season. The Tee is almost "invisible" when I'm wearing it. I've even worn it to sleep in and I'm not a big lover of long-sleeved pjs. As for warmth, over my recent trip to Glen Canyon National Recreation Area, I wore the Tee almost every single day - five straight, in fact. Almost all of those days, the Tee was my base layer under a light zip fleece and a light down vest. It added just the right amount of extra insulation and thanks to the close (NTS) fit, held in my body heat. Conversely, when hiking up steep slickrock canyons, scrambling over boulders, plodding through sandy washes and running from swarming wasps (long story, another time), I got hot and ended up removing a layer - either the down vest or the mid-layer fleece. The SmartWool Tee was stellar at wicking away the sweat so my skin did not get wet and chafed under my backpack straps or waist belt. When I would remove the fleece or vest, the insides were damp, but my skin was not. Which brings me to the fact that thanks to the thinness and smooth hand of the Tee and the close fit to my body, I had no trouble putting on and pulling off any of my current mid-layer tops. No bunching of material of the Tee under the over-layer and I never felt like the Michelin Man. As I said above, I wore the Tee five days straight last week in desert/canyon terrain. I was not too overly careful about protecting my clothing. 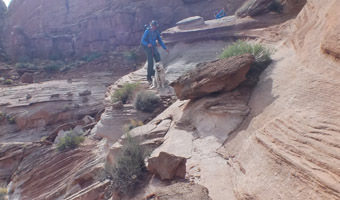 I was more worried about saving myself from certainly very painful landings should I make a mis-step on the slickrock semi-vertical slopes or the woefully narrow sandstone ledges on BuckTank Draw to Rainbow Arch trail that my kids dragged me on! To say, my clothing made very close contact with hard surfaces is an understatement. The Tee survived and my heartrate has stabilized, thank you! My favorite convertible pants and my left knee, well, they will mend eventually. Yeah! See that ledge? Dex & Shawn made it. Waiting for me! Last on my list of base layer requirements is the delicate issue of "odor". After five days straight and that included two overnights, the Tee should have been almost bio-hazard worthy, but it was not. It did smell a bit like wood campfire smoke, but the underarm sniff test didn't cause me to pass out. Not bad. All-in-all, I have to say, the SmartWool NTS Micro 150 Tee is a keeper! I do like this Tee and I know I will be wearing it often in the future, even in the summer time at altitude or possible on cool nights. I just washed it - even though it didn't stink, I think five straight days of wear warrant a washing - and I have it already to go for our upcoming week-long trip the last week of May to the Black Canyon of the Gunnison National Park in Colorado. Thank you to BackpackGearTest.com and SmartWool for letting me try it out.